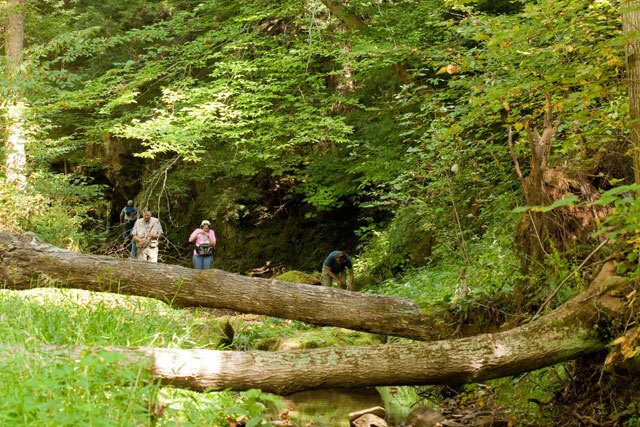 The Fall 2009 foray of the Ohio Moss and Lichen Association, organized by Barb Andreas and Ray Showman, was conducted at three locations in Meigs County. 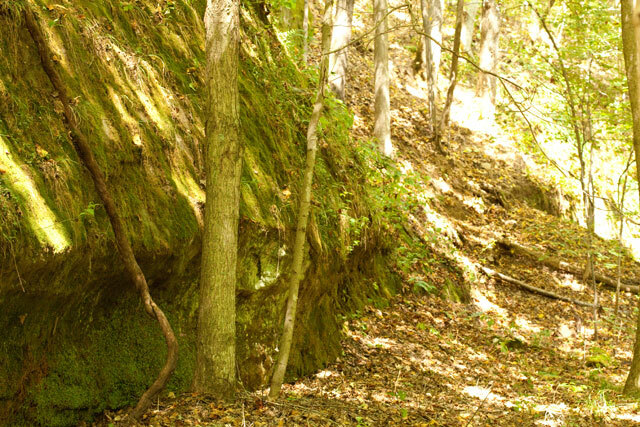 Meigs is a border county along the Ohio River in southeastern Ohio that is rural and forested, but unlike several adjacent counties that have 100+ mosses talled, until today only 50 moss species had been recorded from the county. 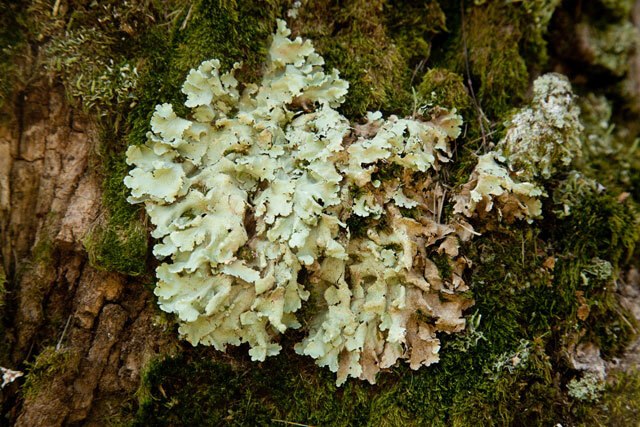 The lichen total, 98 species, is much more representative, but we’re always on the lookout for more. The foray was attended by 13 people, including one participant who was new to our group. OMLA Fall Foray, Meigs County, Ohio. Sept 19, 2009. Collecting began at the Meigs County, Bedford twp. Rt. 33 rest stop (southbound). [39.1260 N, 081.7981W]. This is a fairly large mowed area with lots of trees, good for corticolous lichens and mosses. There are known to be at least 20 lichen species here, but to date it hasn’t been inspected for bryophytes. 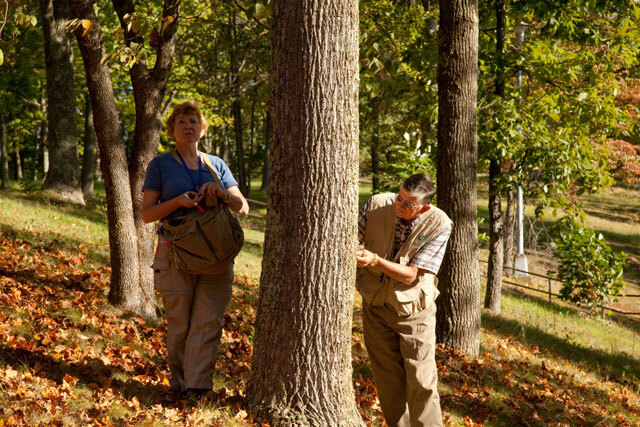 Barb and Ray inspect tree for corticolous cryptogams at Rte 33 rest stop. Meigs County, Ohio. 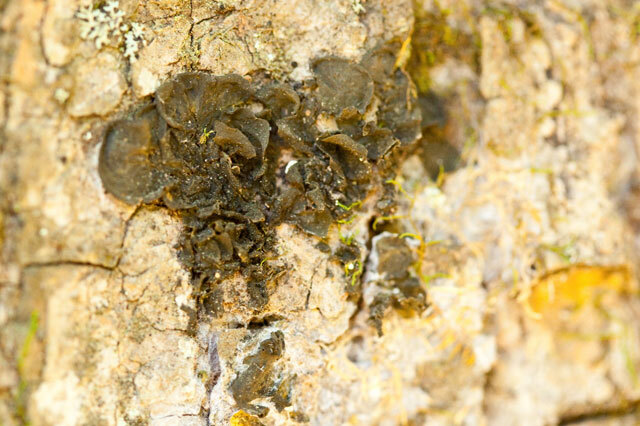 Tree bark is an a great place to see mosses and lichens growing together. Corticolous cryptogams at Rte. 33 rest stop in Meigs County. September 19, 2009. While OMLA’s raison d’etre is to seek and enjoy cryptogams, we occasionally get distracted by vascular plants. In this case, an orchid in fruit (probably Spiranthes vernalis) and a grape fern caught our eye. 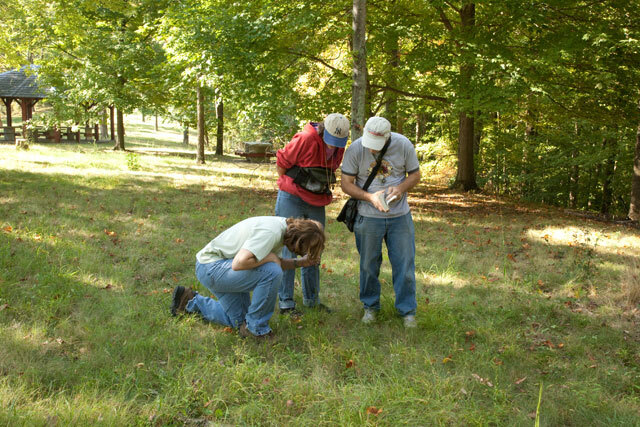 OMLA members Jeff, Carole, and Bill examine an orchid in fruit at Rte 33 rest area in Meigs County. It was fun to see such unexpected plants in a lawn area. Here’s the grape fern. Botrychium dissectum in a lawn area! Rte 33 rest area, Meigs County, Ohio. September 19, 2009. Our next two spots were in the Shade River State Forest. For the remainder of the morning we explored Township Road 265 (Number Nine Road) east [39.1195 N, 081.7981 W ]. This is a small, rocky stream channel with shaded rocks and waterfalls.One of the intriguing cryptogams growing here is a “gelatinous” lichen, i..e., one that has a cyanobacteria phycobiont. Gelatinous lichen at Shade River State Forest. September 19, 2009. The area included some bluff-like sandstone boulders that harbor lichens and bryophytes. Sandstone cliff at Shade River State Forest. September 19, 2009. The afternoon was spent at another location within the Shade River State Forest, a spot along Rice Run Road north. [Meigs County, Olive twp., NW ¼ sect. 30. 39.1788 N, 081.8190 W]. Here much of our time was spent examining saxicolous species on boulders in and alongside Rice Run. 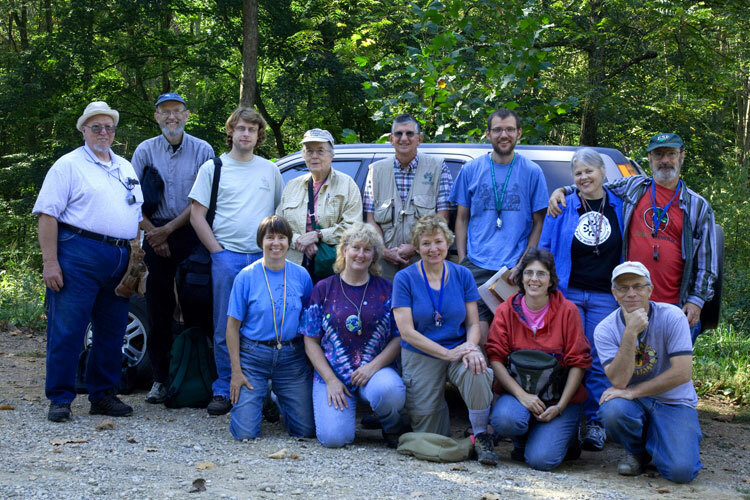 OMLA foray participants at Rice Run, Shade River State Forest. September 19, 2009. 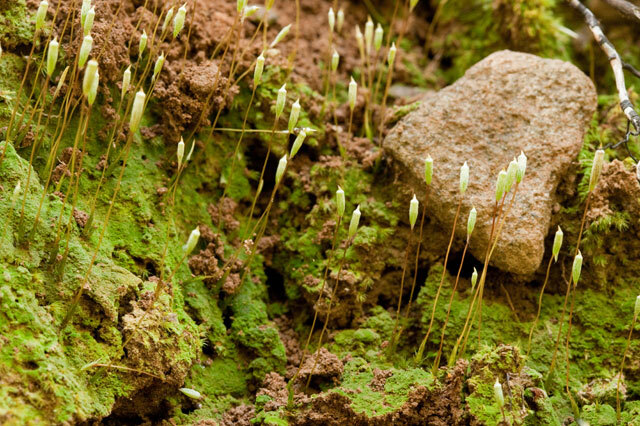 The rocks are home to each of the three major groups of bryophytes. 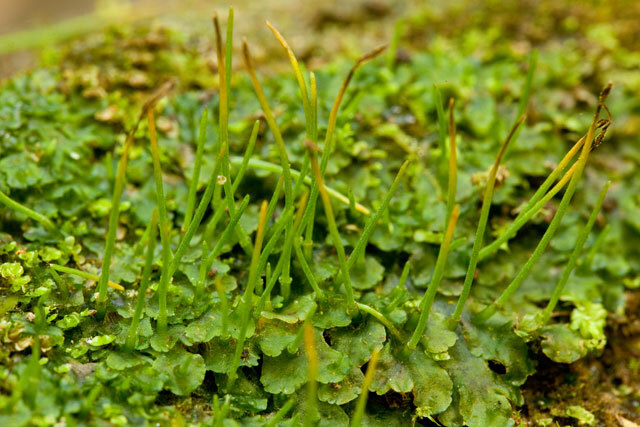 At one time these were regarded as classes within Division Bryophyta, but now they are seen as separate Divisions unto themselves. Hornwort on the rocks (with a twist of lemon?) at Shade River State Forest. Sept. 19, 2009. 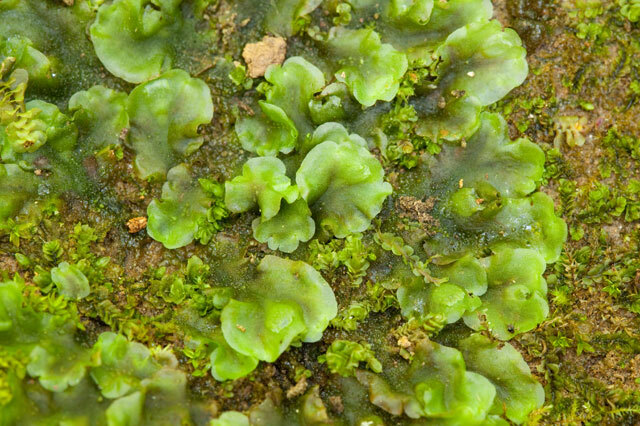 A leafy liverwort at Shade River State Forest, Meigs County, Ohio. Sept. 19, 2009. Thallose liverwort at Shade River State Forest, Meigs County, Ohio. September 19, 2009. 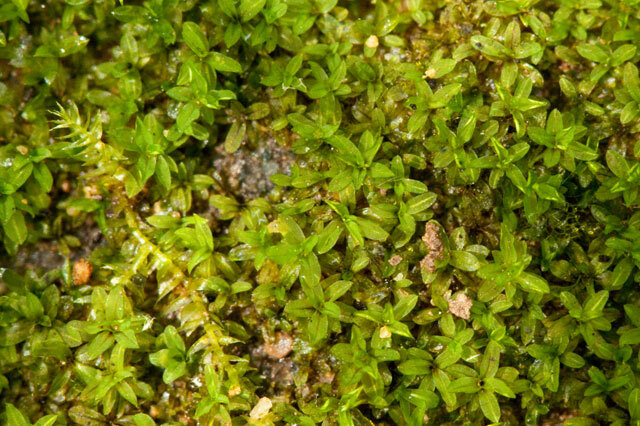 An acrocarp moss at Shade River State Forest. September 19, 2009. 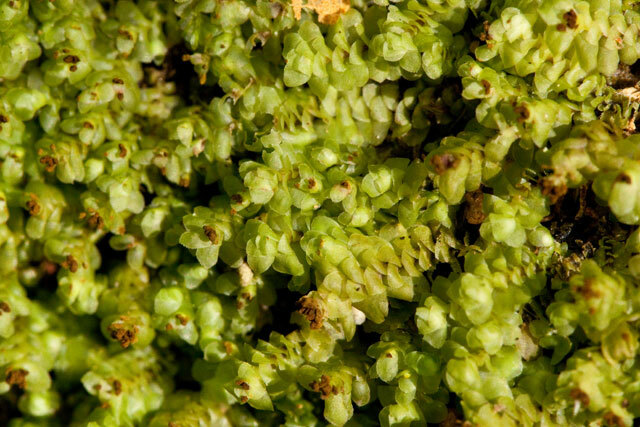 Another moss, distinctive in that it has a persistent protonema, was seen growing on bare soil brought up by a wind-thrown tree. Moss with persistent protonema and reduced gametophyte at Shade River State Forest. Sept. 19, 2009. …as usual, it is thrilling to see special vascular plants. 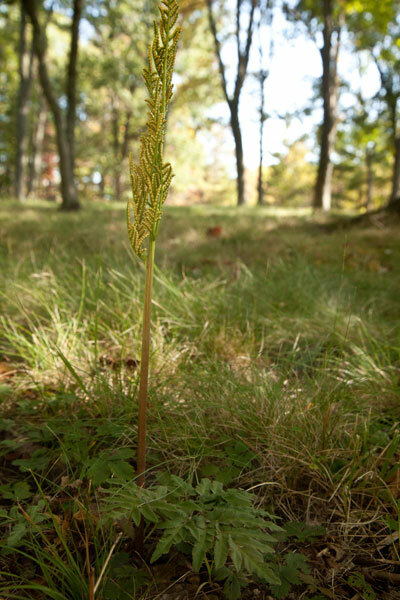 Here’s one –a non-yellow goldenrod! 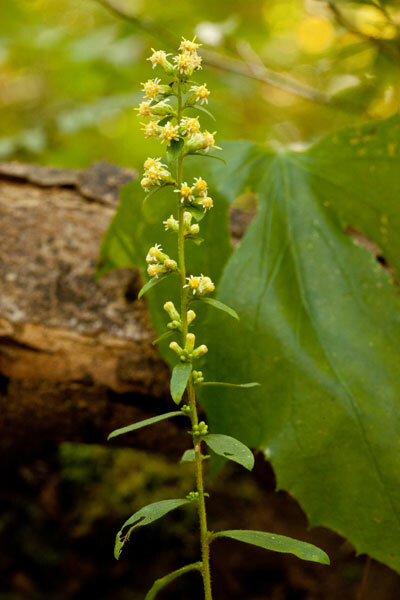 Silverrod, Solidago bicolor, is a woodland species with creamy white flowers. Solidago bicolor at Shade River State Forest. Most OMLA forays include not only a field trip, but some focused lab identification time as well. For our Meigs foray, the identification work was done on a separate Saturday a couple months afterwards. 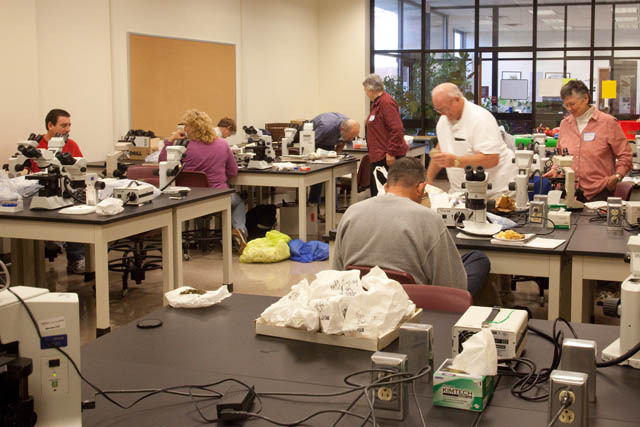 Held November 14 at the OSU Herbarium and hosted by Cynthia Dassler, the lab day also served as a workshop for learning gcryptogam identification, as well as a chance to work on challenging specimens from other sites. 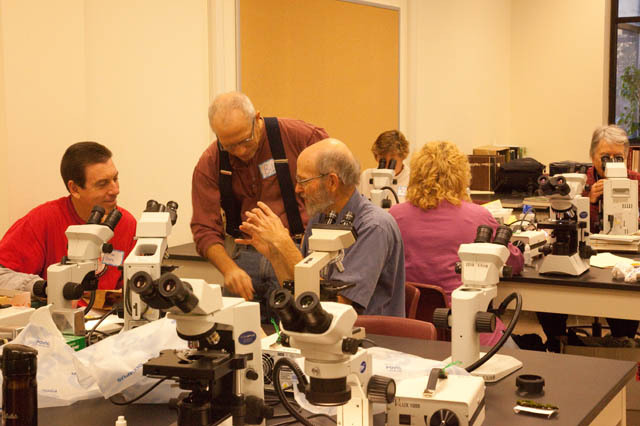 Cryptogam workshop and Lab ID session for the Meigs County Foray. November 14, 2009. 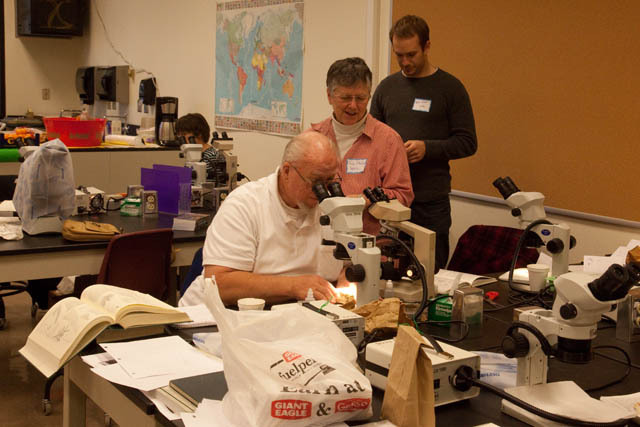 Lichen identification at the cryptogam workshop. Moss identification at the cryptogam workshop. For complete species lists from the OMLA fall foray, see the 2009 OBELISK at the NEWSLETTER page.